Lush is known for creating innovative, hand made and eco-friendly products. Oh, and everything smells incredible. From their Sleepy body lotion which promises an excellent night’s sleep, to the Lush foundation ‘egg’ that is 100% vegan, they’ve got something for everyone. They even offer an amazing double massage at their London store spa which you absolutely need to try. But their latest offering is the thing that’s hitting the headlines – and for all the right reasons. 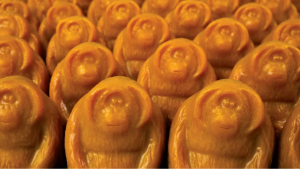 Lush have unveiled a palm oil-free soap in order to save endangered Sumatran Orangutans. Just weeks ago, Iceland released an advert revealing that they are removing palm oil from all their products, but the commercial – which saw a baby Orangutan fleeing his home as a result of deforestation for the substance – was soon banned for being ‘too political’. However, Lush are proudly advertising their campaign against palm oil, which they started last year. Instead of using palm oil, Lush are using extra virgin coconut oil which is ethically sourced from Sumatra, Indonesia. The soaps are available for £8.25 and every penny goes to the cause. Lush is also releasing a limited edition palm oil-free edition of the SOS shampoo bar, containing moringa seed powder, softening virgin coconut oil and patchouli. It’s £8.50 and again, all the money you spend on these environmentally friendly products go to saving the Sumatran Orangutans. In 2017, the brand launched the #SOSsumatra campaign and raised over £126,000. Let’s see if they can do even better this year. The post Lush have unveiled a palm oil-free soap to save endangered Orangutans appeared first on Marie Claire.